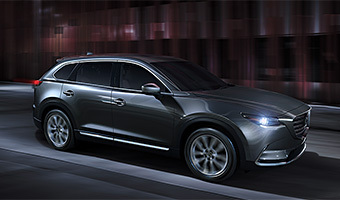 HIROSHIMA, Japan—Mazda Motor Corporation today revealed the all-new Mazda CX-9 at the Los Angeles Auto Show. *1 A three-row midsized crossover SUV featuring the latest SKYACTIV technology and KODO-Soul of Motion design, the all-new CX-9 is a high-end model of Mazda's new-generation line-up. The model has been tailored for the North American market, which is expected to account for 80 percent of global sales forecast at 50,000 units annually. Sales launches start from North America in spring 2016. With the all-new CX-9, Mazda is proposing a new kind of a crossover SUV aimed at more mature families. Offering an indulgent experience of quality and comfort, the model goes beyond specs and functionality to support and enhance every aspect of customers' busy and multi-faceted lives—not just their role as a parent. The latest in KODO design portrays a more premium image and the all-new CX-9 offers quieter, more refined Jinba-ittai driving with superb fuel economy performance. Designed to meet the needs of the modern family, the model offers a comfortable and well-thought-out cabin space, i-ACTIVSENSE advanced safety features and the i-ACTIV AWD all-wheel-drive system. *2 It is the first model to feature Mazda's new 2.5-liter direct-injection turbocharged gasoline engine, SKYACTIV-G 2.5T. "Introducing the all-new CX-9 into the midsize SUV segment will strengthen our new-generation line-up, and we expect a big boost and sustained growth in North America," said Masamichi Kogai, Representative Director, President and CEO of Mazda. "Moving forward, Mazda will continue working to advance our entire product line-up, raise the appeal of the Mazda brand and build a strong emotional bond with customers." *1 Press days are November 17 through 19. The show is open to the public from November 20 through 29. *2 Availability varies by market and model grade.